It was a very wet snow, typical for DC, one of those storms lingering on the edge of the rain/snow line. A damp, cold and miserable day. But I went out anyway, not being one to sit inside, no matter the weather. Perhaps that’s why I love photography so much – it gives me an excuse to get out and explore the world. Ice formed on the hood of my jacket as I trudged up Massachusetts Avenue. When it snows, I enjoy doing a loop around the historic mansions of the Kalorama neighborhood. In my photography, I like classically-framed compositions. I like strong lines and contrast. I like photos that tell a story, ones that you draw you into the frame. Which is why I love the Spanish Steps so much. 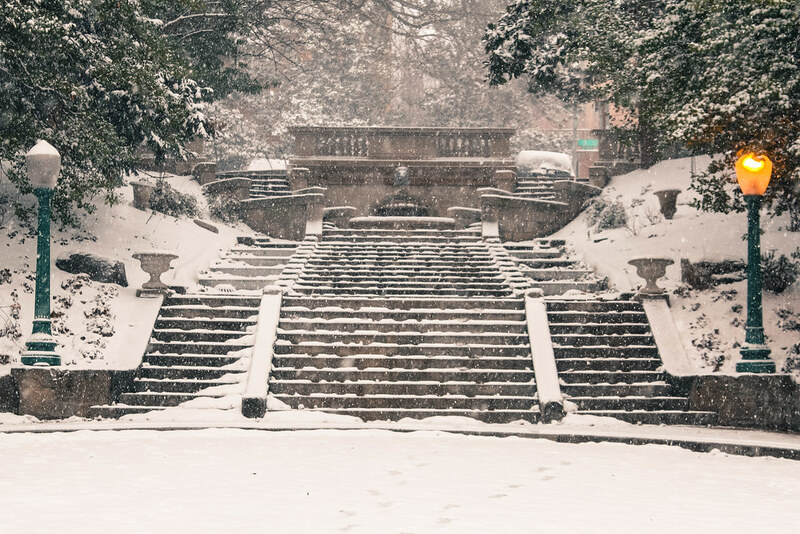 With wet flakes falling on the marble steps, and one streetlight golden, the scene looked like a fairy wonderland. I took off my gloves, pulled out my Canon Rebel, and took this photo. One of the benefits of being an amateur is that my photos are for myself. I took this photograph with no expectation of anything other than producing a pleasing image. A couple of years later, I was walking through Mitchell Park, the green jewel that sits atop the Spanish Steps. There was a flyer for a photo contest, sponsored by the Friends of Mitchell Park. Free to enter, prizes unspecified. Remembering my photo in the snow, I entered it into the contest. Several months later, I received an email telling me that I won one of the categories and would I come to a reception at the residence of the French Ambassador. Sure! There I was trudging up another hill in Kalorama, this time to a Tudor mansion, after a couple of $4 beers at Glen’s Garden Market. 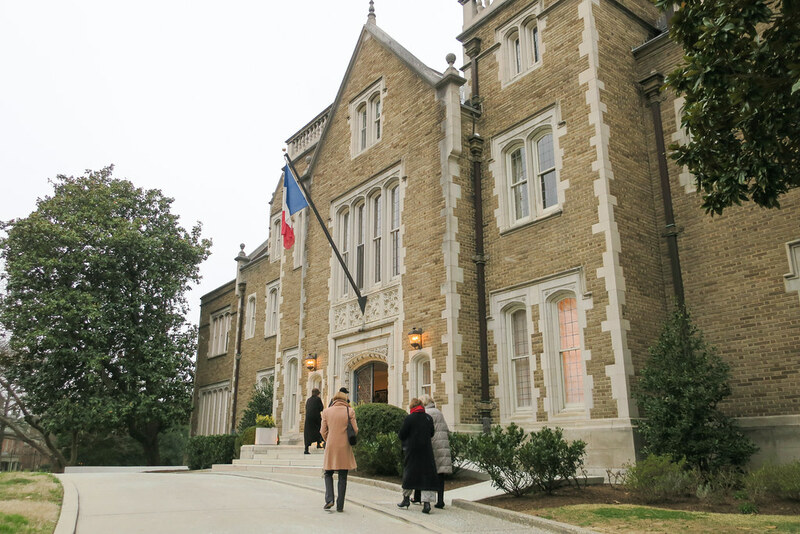 Residence of the French Ambassador, a Tudor-style mansion in Kalorama. Inside, it was like a scene from the Great Gatsby, though the crowd was older, as supporters of the park enjoyed champagne and canapés. The French Ambassador gave a short speech, thanking those present for their support in making Mitchell Park such a special little park. DC parks often depend on outside financial support for their operation. The other two winners and myself were then recognized and given prizes. Mine was a wine tasting for six! That’s way more than I expected from a free contest. The rich are different than you and me, according to F. Scott Fitzgerald. Mitchell Park has some illustrious neighbors, including the Obamas, Ivanka Trump and Jeff Bezos. 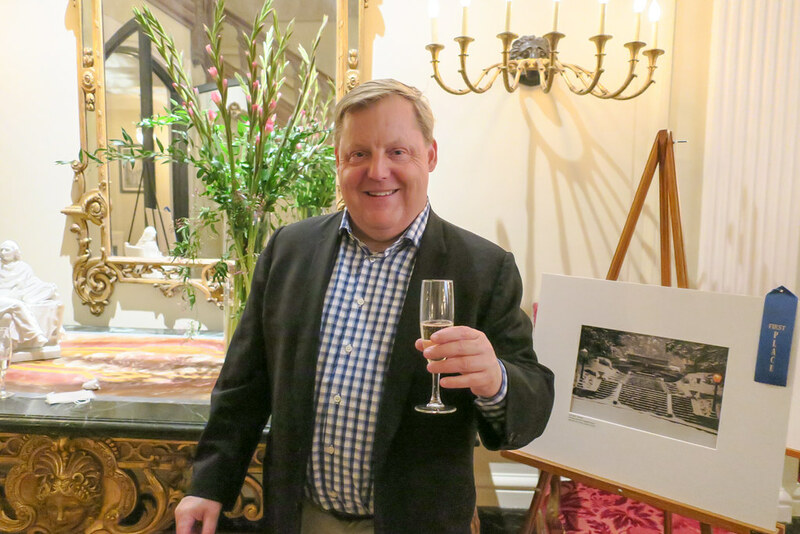 Topics at the reception included speculation on how much the Amazon founder paid for his mansion. While the Mitchell Park supporters were not as wealthy as Bezos or Trump, they were a world away from my $4 beer lifestyle. But money can’t get you everything. Money can’t buy the experience of pulling on your boots and venturing outside in terrible weather. All the riches in the world won’t put you in front of the Spanish Steps on a snowy afternoon, as you line up the perfect shot, your fingers slowly freezing. That’s something that you have to do for yourself.